LG's 42LH3000 scores two early victories over the contender from arch Korean rival, the Samsung LE40B550. For starters, its screen is 2in larger, while being a whole £20 cheaper. But can it square up in other ways? It's not quite as nice to look at, but that's not to say that it's ugly. Quite the opposite, in fact, with its minimalist, glossy bezel, silver trim and subtle power light all producing a fairly glamorous, quality feel. 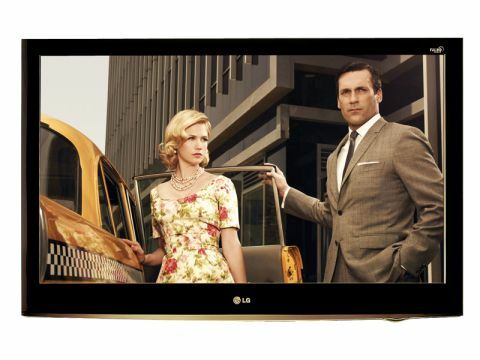 If you're in the market for a slightly bigger TV, this model has a bigger brother in the form of the LG 47LH3000. The TV isn't particularly inspiring connections-wise, however. It's got three HDMIs rather four, and its USB port is there for service use only and not multimedia playback. The set's onscreen menus look promising, however. For a start they are really gorgeously designed and excellently organised. But they're also stuffed with more picture tweaks than you'd ever expect to find on such a small TV. These adjustments comprise multi-level dynamic colour and contrast boosters; a noise reduction circuit, a gamma adjustment; a wide colour gamut option and an edge enhancement system. In fact, the picture preset menus contain a couple of ISF options because, impressively, the independent Imaging Science Foundation has certified the TV as meeting their stringent calibration requirements. If you don't fancy paying an ISF engineer to calibrate your TV and are scared by all the options available, LG offers help in the shape of a Picture Wizard facility. This sorts you out via some simple to follow, onscreen test signals. The 42LH3000 follows the theme of this group test by being a much better performer than it should be for its money. As with most of LG's LCD flatscreens, for instance, its pictures are strikingly bright and boldly coloured. They are also decently natural in tone too, provided you avoid the 'Vivid' default setting. They don't usually come without a respectable black level response and that's exactly what the 42LH3000 has. Blacks aren't as deep or as natural as those of our Samsung and Panasonic contenders, but they're good enough not to distract you while watching dark scenes. HD pictures, meanwhile, are crisp and detailed, and standard definition pictures are also perfectly engaging, proving reasonably free of noise, and passably, if not exceptionally, sharp. The set's pictures do suffer colour and contrast loss if viewed from an angle, in keeping with all of the other LCD contenders. Our sample also showed a slight dimness in the extreme corners during bright scenes, but this is seldom visible. With a solid-to-good audio performance to back up its likeable pictures, the 42LH3000 ultimately classes as a fine budget set.